Longtime fans of progressive metal band Fates Warning will remember the band's early albums, like The Spectre Within and Awaken the Guardian, with original vocalist John Arch. With his dismissal, in 1987, the band brought in singer Ray Alder and released No Exit, which garnered high praise in prog circles and set the band on the path to success. is set to release their debut album, Sympathetic Resonance, on September 13, on Metal Blade Records. The record comprises just six tracks but—in true prog fashion—clocks in just shy of 55 minutes, with three tunes eclipsing the 10-minute mark. In a strange twist of fate (pardon the pun), much of the material was destined for a new FW record. "A lot these songs—"Neurotically Wired," "Midnight Serenade," "Stained Glass Sky," and parts of others—started off as material for the next Fates Warning record," says Matheos. "Ray (Alder) was unable to commit to a record at that time so I approached John about doing a couple songs together, maybe another EP. We just took it one song at a time and didn't even really consider doing a full length CD until probably over half the record was written." Matheos further offered his insight on the writing and recording process of Sympathetic Resonance: "I think John and I work really well together. There's a lot of mutual respect and trust in what we do. But, we're also both very critical of ourselves, and each other. This can make for a long and, sometimes, tedious process. But ultimately it's one I enjoy because I think it brings out the best in both of us." John Arch adds: "When I first heard some of the arrangements Jim had written and recorded, it took quite some time before I could wrap my mind around the odd time signatures and guitar work going on here. There are some long compositions, so putting anxiety and apprehension on the back burner it was time to dissect these numbers into digestible bits. After the lengthy process of lyrics and melodies, listening to the songs now, I can't imagine them any other way. "Lyrically—with the exception of 'Epitaph' from The Spectre Within, where I am in the first person, there has been a pattern of using characters, imagery and symbolism to create stories, where the characters are in the forefront acting out the story line. This time, much like A Twist of Fate, the man again steps out from behind the curtain without the third person to reveal his human flaws. There are still plenty of metaphors and phrases that are open to interpretation, but just how transparent or relevant the meanings are to those who read the lyrics we will have to see." We got to hear one sample tune, and the very promising beginning of a second, but not enough to render any real judgment. But if it's anything like the classic below, we'll be looking forward to this album very much. Guitarist George Lynch and his reformed Lynch Mob (Lynch, guitars; Oni Logan, vocals; Robbie Crane, bass; Scott Coogan, drums) have announced a late summer tour beginning on July 29th in Houston, TX and finishing in late August on West Coast, with more dates to be announced shortly. As previously announced, Lynch's new solo album, Kill All Control, comes out July 19 on Rocket Science Inc. The album was originally intended to be the follow-up to the Souls of We debut, Let the Truth Be Known, but Lynch quickly realized the project was taking on a new direction with the addition of Powerman 5000 drummer, Adrian Ost. In collaboration with Souls of We singer, London LeGrand (Brides of Destruction), Lynch noted that, "the creative juices just flowed and we wrote most of the CD in 10 days." Kill All Control combines many of Lynch's various styles and histories, including a follow up to his signature instrumental Dokken track "Mr.Scary," titled "Son Of Scary" (see video below) and featuring Fred Coury of Cinderella on drums. Additional guests on the album include vocalists Will Marten (Earshot), Marc Torien (Bullet Boys), and Keith St. John (Montrose). Lynch says that he hopes he's created an "eclectic listening experience for all my fans." Additionally, we're working very hard to cement a date and time in mid-July when George will join us here at GuitarInstructor.com for a live chat. Be sure to check our live chat page for all the latest details. 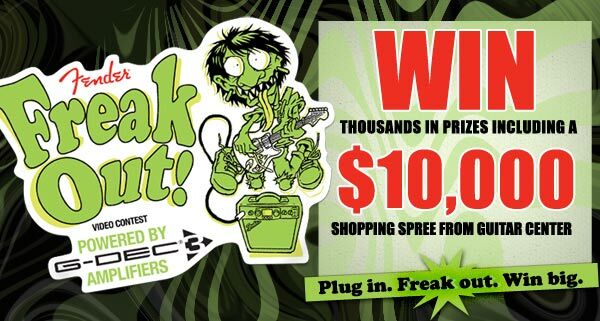 Our fine, funky friends at Fender have created a cool contest called the Fender Freak Out, powered by G-DEC 3 Amplifiers (Note: I have one, and they're awesome!). All you need do is film yourself "freaking out"—that is, performing an original piece of live music using any version of the G-DEC—for one to three minutes, upload it to Vimeo or YouTube, and then enter the video ID code and your contact info on Fender's official Freak Out web site. Every two weeks from July 1 through September 8, Fender will choose the best video based on creativity, style, and musicianship. Each winner will receive the latest G-DEC 3 Thirty amplifier, the Fender Hal Leonard songbook series for G-DEC, and a trip for two to the Hard Rock Hotel in Chicago this October to compete live for the grand prize -- a $10,000 Guitar Center shopping spree. Enter as often as you like. Must be 18 or older to enter. For more info, and for the URL of that official Freak Out web site, click here. Meanwhile, do like Nile say, and "Aaaaahhhh ... Freak Out!" Wanna play the new smash hit "Country Song" by South African rockers Seether? We just posted the official, artist-approved, note-for-note guitar tab at the link below. While the tune, which currently (6/27) sits at #2 on the Billboard rock chart, was recorded in Nashville, this ain't country music. Singer/guitarist Shaun Morgan says the title comes from the "swampy verse riff," but also maintains that the tune is a small homage to Music City. I was just a wee lad beginner guitarist when I first heard Tony MacAlpine, around 1985, and decided that I wanted to play like him. Well, that may not have happened, but I do still enjoy a rip-roarin' round of shred from time to time, and few guitarists pull it off with more grace and style than Mr. MacAlpine, which is why I was rather excited to see his new self-titled album arrive in the mail last week. Tony MacAlpine is the guitarist's 13th solo album (and 26th, overall) over the course of his 25-plus year career, and from the opening downtuned roar of "Serpens Cauda," it's apparent that MacAlpine has not been resting on his redlined riffs since his last solo record, nearly a decade ago. One of the more interesting aspects of the record is how much it leans progressive. Few and far between are the basic rock beats and bass/rhythm guitar root chugs that too often dominate "shred guitar" albums. From opening rocker "Serpens Cauda" through "Ölüdeniz" and "Fire Mountain," evidence mounts that MacAlpine has been paying attention to progressive metal bands like Dream Theater, Nevermore, and Symphony X, which in turn makes for a richer, more complex listening experience. The fact that MacAlpine brought in drummers Virgil Donati and Marco Minnemann to play on various tracks certainly doesn't hurt that effort. Both are skin-beating beasts who not only match MacAlpine's intensity but also stretch boundaries. At the same time, MacAlpine shows he can play equally well inside the box, borrowing from the Eric Johnson and Joe Satriani school of melodic mastery on "Dream Mechanism." But following that, perhaps the most mainstream-sounding track on the record, MacAlpine takes his cues from his fusion work and perhaps from his employer of late, Steve Vai, for some rather quirky and brilliant outside ventures on "10 Seconds to Mercury." On "Flowers For Monday," MacAlpine explores his Classical roots, with a dirge-y bed of piano arpeggios topped by a sparse steel-string acoustic melody, whereas "Angel of Twilight" is a throwback to MacAlpine's uptempo mid-'80s material, as is "Pyrokinesis" (see video below) albeit with a bit of an early Oughties' "nu-metal" groove in the riff. The album's standout track, though, is "Summer Palace," a highly syncopated, fusion-leaning piece with Donati on drums. The sparse arrangement puts you at the edge of your seat, as it invites anticipation and gives MacAlpine plenty of room to explore, both harmonically and rhythmically. In 2009, the 2-CD set Chicago Blues: A Living History paid homage to the blues pioneers who created the Chicago sound as well as the current musicians who carry the Windy City blues torch. The album was warmly received by fans and critics alike, even receiving a Grammy nomination for Best Traditional Blues Album and numerous other blues awards. So, the folks behind that fabulous set have just released Chicago Blues A Living History: The (R)evolution Continues, a 2-CD set that presents that sweet-home sound in all its Second City glory. Produced by Larry Skoller and backed by the Living History Band (Billy Flynn, guitar; Matthew Skoller, harmonica; Kenny "Beady Eyes" Smith, drums; Felton Crews, bass; Johnny Iguana, keys), this new 2-CD set features the music of such iconic bluesmen as Lonnie Johnson, Muddy Waters, Willie Dixon, Bo Diddley, Elmore James, and Otis Rush, played by equally influential artists like Buddy Guy, James Cotton, Magic Slim, and Ronnie Baker Brooks, among others. The set kicks off with the Lonnie Johnson gem "He's a Jelly Roll Baker," with Billy Flynn capturing the sound and spirit of Johnson's tasty, jazz-inflected single-note lines. On the electrified Delta blues of Muddy Waters' 1949 piece "Canary Bird," guitarist John Primer gives a wonderful reading of Waters's genre-defining slide lines. On "Rocket 88," 75-year old James Cotton whips out his harp and reprises the classic blowing on the same tune from his 1974 release 100% Cotton. Disc 1 wraps up Diddley-beat style via a medley of Little Walter's "Mellow Down Easy" and Bo Diddley's "Bo Diddley." Buddy Guy sits in on both vocals and guitar for Little Brother Montgomery's "First Time I Met the Blues" to launch Disc 2 in grand Chicago fashion. Guy's playing is downright fierce here, unfortunately dwarfing Flynn's otherwise stellar effort. Up next is Magic Slim's take on the Chuck Willis tune "Keep a Drivin'," in which Slim is reunited with his former Teardrops colleague John Primer. Two tunes later, Primer takes on the vocals of Howlin' Wolf, arguably the most influential blues singer of all time, on his 1962 side "Howlin' For My Baby." Disc 2 then leaps through time to 1980, for a Zora Young-led take on Sunnyland Slim's "Be Careful How You Vote." After a brief retreat to the '60s for the jazz-touched Fenton Robinson classic "Somebody Loan Me a Dime," which features some of Flynn's niftiest fretwork in the set, we jump back into '80s and '90s, with late-life work from Lonnie Brooks and Otis Rush, before closing the set proper with Ronnie Baker Brooks's 1998 track "Make These Blues Survive," which features the feistiest guitar playing the album—save for Buddy Guy's—courtesy of Mr. Brooks, one of the preeminent Chicago blues musicians on the scene today. The set also offers the bonus track version of Muddy Waters's "The Blues Had a Baby (and They Named it Rock and Roll)," extensive liner notes that offer background on the Chicago Blues: A Living History project, as well as informative commentary on each track, a timeline of Chicago blues history, and myriad quotes from the Living History Band. Thanks to my old pal Dale Turner for turning me onto this li'l gem of a video featuring a young Mike Stern playing with Billy Cobham and shredding bop lines on a '70s Fender Strat. Have fun!